The Halloween headlines in the financial media look really scary. 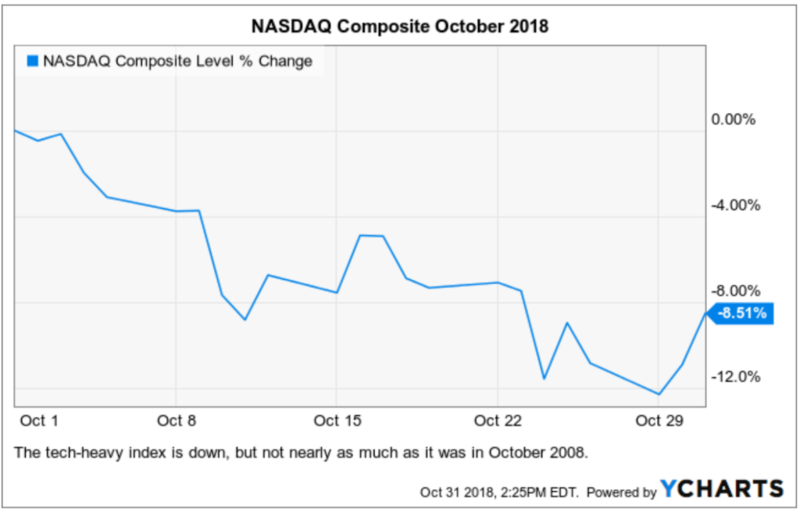 In fact, I’ve seen many alarming leads today telling me that the NASDAQ Composite is on pace to have its worst October since the dreaded drop of 2008. 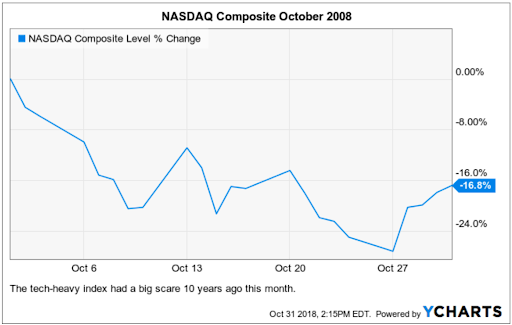 So, in the spirit of the ghosts of Halloween past (hat tip to Charles Dickens here for the borrowed literary reference), let’s take a quick look at the chart of the tech-heavy NASDAQ in October 2008. As you can see, shares plunged nearly 17% that month. And, of course, the worst in markets was yet to come. Fast forward to the ghosts of Halloween present, and we can see a decline in October, but nothing as ghoulish as what happened a decade ago. Here we see the NASDAQ down 8.5%, which is certainly a significant pullback for a major index during a single month. That pullback caused a lot of angst on Wall Street and on Main Street, as investors of all stripes got spooked by the selling goblins. Still, what we have to keep in mind is that even though sellers came out and tripped the bulls this month, the bear-market warlocks have yet to come anywhere close to imposing their will on markets the way they did 10 years gone. Now, I suspect you remember what things were like in October/November 2008 (I certainly do), and they were nothing like the conditions we have today. Back then, the scare was palpable, and caused by disastrous revelations that nearly plunged the world into a financial death spiral. My friend and market analyst extraordinaire, Tom Essaye of the Sevens Report, gave me an insightful description of the differences between then and now. It’s safe to say we are a far cry from the pernicious conditions of a decade ago. Still, there are legitimate concerns in the markets right now that shouldn’t be ignored. The fact is that one of the two pillars holding up the equity rally for most of 2018, i.e. strong corporate earnings growth, has slowed markedly as a result of cautious Q3 earnings reports. It is not that earnings have been bad on the numbers. They really haven’t. What has been disappointing about this earnings season is that there have been many high-profile earnings warnings for Q4 and beyond, and the qualitative commentary and forward guidance for many of the market’s biggest and brightest have been less than encouraging. Then there’s the ongoing issue of the trade war between the United States and China, a worry that will continue to sew a layer of uncertainty into this market’s cloth until something is positively resolved. Another concern here is the Federal Reserve moving too fast on monetary policy by hiking rates too high and potentially choking off future economic growth. Finally, we have the midterm elections just six days from now, and how that turns out could throw another wrench of uncertainty into the financial markets. It’s one thing if Democrats take back control of the House of Representatives. That outcome would elevate political risk. But frankly, this result has largely been priced into markets over the past month. The bigger uncertainty, and the potential cause for continued selling into year-end, is if Democrats also take control of the Senate. This outcome would heighten political risk, and that could bring more selling witches out of their broom closets. Will those witches fly unimpeded over Wall Street the way they did 10 years ago? Responsibility is a heavy burden. But for those who assume the responsibility that comes with life and overcoming its inevitable hardships, the mere admission of said responsibility can actually be a reward in itself. That’s one of the themes that runs through the work of clinical psychologist and best-selling author Dr. Jordan B. Peterson. The way Peterson sees it, if you think the meaning of life is achieving happiness, what happens when you’re unhappy? Instead of pursuing happiness, Peterson suggests pursuing that which is truly meaningful, and it is through this pursuit that you’ll be faced with the responsibility of acting in a manner that makes life meaningful. Now, I’ve been contemplating these ideas of late, having recently read Peterson’s best-seller, “12 Rules for Life: An Antidote to Chaos.” And, because of my responsibility as the editor of this publication along with my other newsletter advisory services, I tend to see things through market-colored glasses. Through those lenses, I also see this market as a way to aim for meaning over happiness. Let me explain. The equivalent of pursuing happiness in markets is to make the big score with a big trade, and to ride the hot momentum stocks all the way up. And, when things are going well in a bull market, those big wins tend to bring a lot of happiness. Yet what happens when things don’t go well? What happens when your momentum trade crumbles and falls below your stop loss? Well, that tends to be the opposite of happiness. In fact, it tends to be the definition of actual pain and loss. And, based on the market action over the past several weeks, now is a time when a lot of unhappiness is wafting on Wall Street. Now, I’m not saying that there isn’t a place for momentum investing or quick-hit trading. In fact, I think it can play a big, positive role in your overall returns. This is especially true if you’re the type who likes to put money to work in pursuit of short- and medium-term alpha. Yet, what’s always important to remember is that what’s really meaningful when it comes to investing is to build wealth the responsible way. To that end, you must do so with a strategy that’s focused on the long term, and one that allows you to better deal with the inevitable ebbs and flows of market volatility. And just to remind you of that volatility in markets of late, take a look at the six-month chart of the S&P 500 Index. 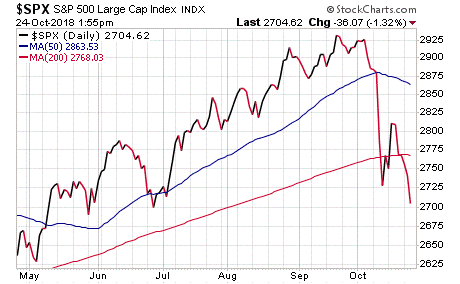 As you can see, in mid-October the market fell below key support at the 50-day and the 200-day moving averages. Since then, we’ve bounced back above the 200-day moving average several times. Yet the latest decline in stocks over the past couple of sessions has pushed the broad measure of domestic equities well below the long-term moving average. So, what do you do now if your goal is to pursue meaning (i.e. long-term wealth building)? Well, that answer depends on the type of investor you are. If you are a long-term investor who has built a portfolio of stalwart dividend stocks over the years, then the recent pullback shouldn’t bother you very much. If you’re an investor who follows the trends, then you should have had a plan in place that moved much of your allocation to the safety of cash as soon as stocks initially fell below that key 200-day moving average. Readers of my Intelligence Report advisory service have been building positions in stalwart, dividend-paying stocks for years, so this little hiccup is no more than a bump in the road on their pursuit of investing meaning. Meanwhile, readers of my Successful Investing advisory service have been a bit more proactive of late, using that key technical break of the 200-day moving average to lighten up on equity positions and ride the volatility out in the safety of a high cash position. Both of these approaches are based on pursuing meaning with your money, and both are designed to preserve and grow capital. And though each approach comes at the goal from different angles, the bottom line of pursuing long-term financial meaning is the same. As the Buddhist adage goes, “there are many paths to enlightenment,” and so too are there many paths to financial meaningfulness. But first, one must aim for meaning over happiness. The story of the Headless Horseman, originally part of “The Legend of Sleepy Hollow” by Washington Irving, is a gothic literary classic. One reason why it’s become a classic is because the concept of being “headless” and riding blindly through the deep woods (pun intended) is a metaphor for man’s journey through an incredibly complex, frightening, dangerous and eminently unknowable world. More importantly, the story can be read as illustrating the destructive power of those who fail to “have their heads,” i.e. those who fail to use reason and who choose the path of violence and fear to get through life. The wider takeaway here, in my view, is to not give in to your headless nature, and to confront reality with courage, focus and your only tool of survival — your rational faculty. Paul Dykewicz explores Tesla's finances and recent news for the controversial company.